Washington, DC, Mayor Adrian Fenty (L) speaks as U.S. Del. 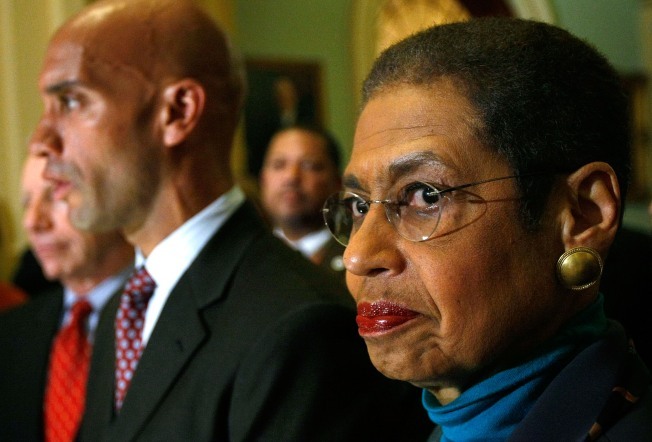 Eleanor Holmes Norton (D-DC) (R) listens during a news conference on Capitol Hill February 26, 2009 in Washington, DC. The U.S. Senate earlier passed the District of Columbia House Voting Rights Act. D.C. Delegate Eleanor Holmes Norton will take it up a notch in her long-running feud with Comedy Central’s Stephen Colbert, revived on several episodes of The Colbert Report. Norton plans to attend Saturday’s Rally to Restore Sanity and/or Fear, as it has come to be known, with Colbert and Comedy Central’s Jon Stewart. Norton will meet DC Vote supporters at 6th and Pennsylvania Avenue NW at 11 a.m. so they can attend the rally en masse and send a message to Colbert. “We are doing more than showing the flag for D.C. We will be demanding the vote, right in front of the man who has popularized ridiculing me, and by proxy, District residents, for not having voting rights,” Norton said in a statement.